Is the little brother in the Galaxy range an Ace up Samsung's sleeve? A well-priced and featured phone let down by its low-quality screen and slow processor. UPDATED: The Samsung Galaxy Ace is still being touted as a top smartphone years after its launch, so we've updated our review accordingly. Should you consider it at all despite it's super-budget price tag? Once a bit player on the smartphone scene, famed more for questionable construction than standout handsets, Samsung has turned a corner in recent years, establishing itself as a genuine player on the pocket phone front and producing some of the most desirable handsets on the market. Following on from the success of the high-end Samsung Galaxy S and Samsung Galaxy S2, the Korean tech behemoth expanded its range of intergalactic-named mobile phones, with the Samsung Galaxy Ace touching down last year as a mid-level handset. Tasked with raising the expectations of what is possible from a wallet-friendly smartphone, the Samsung Galaxy Ace, which also flies under the flag of the Samsung GT-S5830, has since spawned a sub-series of its own, with the Samsung Galaxy Ace 2 also landing on the market. Lining up with a display size similar to that of the Apple iPhone 4S, the Samsung Galaxy Ace's 3.5-inch TFT screen is no match to that of its Cupertino-crafted rival, and is just one of a number of aspects that fall below the benchmark set out by the iOS-powered handset. While a 5-megapixel rear-mounted camera lines up well alongside snappers infused within handsets generally superior and pricier than the Samsung Galaxy Ace, the handset's imaging abilities are diminished, on paper at least, by its lacklustre maximum 640 x 480p video recording capabilities. In terms of base specs, the Samsung Galaxy Ace boasts an 800MHz single-core Qualcomm MSM7227 processor. This is now significantly below par for the influx of 1GHz CPU mid-range smartphones and even the odd dual-core entrant. But it lines up with that of the new Motorola Motoluxe, a handset one year the Samsung Galaxy Ace's junior. Although available for free on a variety of pay monthly tariffs with a variable collection of inclusive minutes, texts and data allowances, it's now priced at just £90 on PAYG, and from £7.50 on contracts, making it a true budget smartphone. However that doesn't mean it's any good of course - and with older software and yesterday's specs, why is it still being pushed? Now cheaper than the likes of the 3.7-inch ClearBlack AMOLED display-packing, Windows Phone 7.5-powered Nokia Lumia 710, the Samsung Galaxy Ace remains in an area of the market flooded with competition such as the full QWERTY keyboard-touting BlackBerry Curve 9300 and the Android 2.3-powered, 8MP camera-hosting Sony Ericsson Xperia Ray. Many of today's high-end smartphones are following in the footsteps of the iPhone by being made available in an eye-catching white hue a few months after the original standard black model lands. Samsung, with the Galaxy Ace, has killed two birds with one proverbial stone by offering the device with a pair of interchangeable back panels that take us back to the days of the Nokia 3330. While not quite matching the rest of the "onyx black" smartphone in terms of colour, aesthetics aside, the packaged black rear panel offers a more user-friendly feel in the hand than its smooth, glossed white counterpart, with the diamond-cut uneven surface offering a certain amount of grip. Sleek, stylish and well finished to the eye, in the hand the Samsung Galaxy Ace is - despite its budget plastic construction and weight-saving efforts - a surprisingly reassuring offering, with little flex when put under pressure. Well-constructed, the Samsung Galaxy Ace features no unsightly seams or unnerving spaces between components, but does suffer from a selection of poorly placed buttons. Despite featuring just three physical buttons (home, volume and power/sleep) two-thirds of these are placed in locations that lead them to be accidentally pressed all-too frequently. When holding the Samsung Galaxy Ace in a standard manner in the left hand, the user's thumb lies across the increase aspect of the volume controls with the index finger wrapped firmly around the sleep/power button. In the right hand, the power control is in prime thumb real estate, with the middle finger at risk of toggling the lower half of the volume seesaw. More of an irritant than a debilitating flaw, the lack of foresight on Samsung's part of these core design aspects is something that often leaves us on edge and forces an unnatural, unbalanced grip in order to avoid accidental presses. Reasonably chunky up top, the Samsung Galaxy Ace has been made fatter and more top-heavy to make space for the 3.5mm audio jack and covered micro USB port at the top. Although helping smooth out the handset's design and remove unsightly docks, the micro USB slider is stiff and fiddly, making it awkward to gain access to the port with one hand. Standing up well to the odd knock and bump against coins and keys, the Samsung Galaxy Ace's relatively robust exterior showed little damage from everyday use during our time with it. However, thanks to its largely plastic finish, it is a handset that is likely to show its age after a few months of use. Helping redeem the handset's controls, the Android 2.3 Gingerbread-powered device's touchscreen base Android menu and back controls are a joy to use, with a large surface area that is highly responsive and helps provide a fluid user experience. The target user base for the Samsung Galaxy Ace isn't one that will mostly care for the latest version of Android (first time smartphone users are key here) and while Gingerbread is creaking under the weight of the phone these days, we can't make a huge case for it to be rocking the latest version of Jelly Bean. Lining up at an uninspiring 11.5mm thick, the Samsung Galaxy Ace is considerably chunkier than the minimalist iPhone 4S, but is a mere 0.2mm thicker than the flagship HTC Sensation. In terms of weight, the 113g heft provides a reassuring feel in the hand, but, considering the 4.3-inch Samsung Galaxy S2 is just 2g heavier, users could be forgiven for expecting a lighter handset. Arguably the most important component of any smartphone that uses its touch-sensitive display as a means of control as well as for content and media absorption, the Samsung Galaxy Ace's 3.5-inch screen is an acceptable offering that fails to stand out from the crowd on any front. 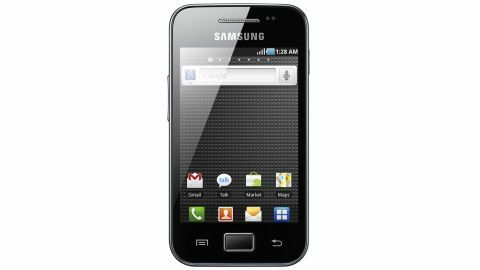 With a 480 x 320p resolution and 165 pixels-per-inch image density, the Samsung Galaxy Ace's TFT capacitive touchscreen is distinctly average, with images of an acceptable but far from inspiring or eye-catching standard. While providing a passable viewing experience for video playback, image viewing and application use, the Samsung Galaxy Ace fails to live up to the high screen standards that have come to be expected from Samsung's mobiles. It's far from the vibrant AMOLED offerings that have landed on a selection of Samsung's high and mid-range devices in the past 18 months. Indeed, the Samsung Galaxy Ace is some distance behind the latest 720p and 1080p Full HD screen that have hit the likes of the Samsung Galaxy Nexus, with muted colours and a lack of pin sharp detail. Largely bowing to user command, the Samsung Galaxy Ace's screen can, at times, be a little unresponsive, prompting a couple of firm presses before registering a desired action. Not all doom and gloom, the Samsung smartphone's screen, combining forces with the Android OS, automatically dims itself when the handset's battery is reaching the lower end of its abilities. to further eke out the remaining juice. Meanwhile the screen's Gorilla Glass layering helps protects against scuffs and scratches.